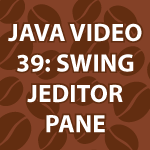 In this part of the Java Video Tutorial, I cover the JEditorPane Swing component. It allows you to both display rich text and HTML documents. I also cover how to listen for events in JEditorPane, when users click on links for example. These events are handled by HyperlinkEvent and HyperlinkListener. Because some people are having trouble with Eclipse, I also show how you can get Eclipse to do some coding for you. It helps people find my tutorials. THis is a Nice as usual , bro why not u sometime post some other tutorial beside java. because we want want to develop our skil on different topics for web design. but i love ur tutorials. THanks for sharing. I try to make tutorials that don’t require users to spend a bunch of money on software. I don’t make much money on my site and can’t afford the software either. I also don’t like to do tutorials on subjects that are brand new. The reason why is because they are normally flawed and then go away or change dramatically. I normally try to cover topics like Java completely. The reason why is because it is hard to drop a tutorial this big for a few weeks and then go back to it. I forget what I covered and try to build on each part of the tutorial. Tell me what topics you’d like to see and I’ll do my best to cover them. hii, if possible please add android also in you list.. I like your tutorials, very very much. You explain very well each line of code. I started following you a while ago. Don´t have much time, as far as i can i´ll try to understand and follow every JAVA tutorial. Note: You are very fast writting tutorials? About the previous topics about what type of tutorials, i´d like to see some IOS programming. I was thinking in switch to a MAC, and i´d love to know how to make an app for IPHONE or IPAD. But now i´m focused on JAVA. Anyway, thanks for good work.